A team from Messiah Foundation USA set up their booth at the Body, Mind Spirit Expo at Greensboro Coliseum Complex on November 13-14 2016. There, Messiah Foundation USA offered visitors free spiritual healing and granted Invocation of the Heart of the divine name, Ra Riaz. 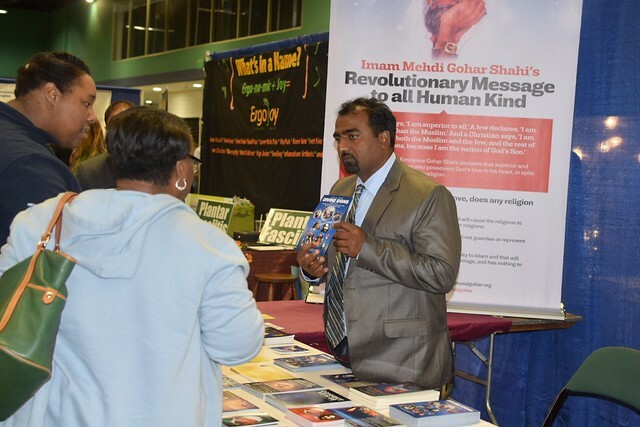 The expo was attended by approximately 2000 people, who were very receptive to Lord Ra Riaz Gohar Shahi’s message of divine love. During the expo, we conversed with visitors about the Supermoon. We invited the attendees to investigate the image of the Awaited One on the Moon and experience the bounty of Lord Ra Riaz Gohar Shahi for themselves. We explained to the attendees that the teachings of His Divine Eminence Ra Riaz Gohar Shahi concern itself with reviving and enlightening the hearts with God’s name. Many aspirants were delighted to hear about the Awaited One. Our booth was extremely busy and the response from the public was fantastic! Many people took the Holy Scripture of His Divine Eminence, The Religion of God (Divine Love) for investigation purposes and personal interests.